Sunbeam Tigers have long been the stepchild of the Shelby Cobra community. They have been denigrated as the "Poor Man's Cobra" and often not even allowed in parade laps and car corrals by the uppity Mustang (how many of those were made again?) crowd. In 1991 I attended the SCCA Runoffs at Road Atlanta, the so-called Olympics of sports car racing. On Saturday of the event I showed up with a friend in my Tiger and was grabbed by the local SAAC (Shelby American Automobile Club) president and told that I should come back on Sunday for the parade lap at the start of the races when "The Man" (Carroll Shelby himself) would drive a real Cobra followed by other cars of his creation. Since the SAAC rep was a former Tiger owner he was sympathetic. On Sunday morning I showed up with my 10 year old son and reported to the paddock to be lined up for the parade lap. True to form, the posers running the show told me to report to the very end of the line as the lone Tiger participant. Shel would be driving a 289 vintage racer followed by 28 Shelby Mustangs and me in the last position, presumably to pick up the Mustang turds. While sitting in the Tiger at the starting grid I spotted a golf cart approaching out of the corner of my eye. The car pulled up right next to me and I was astonished to find Carroll Shelby nose to nose with me. He had on a Dodge Viper hat (he had recently participated in developing the Viper and had driven it as the Pace Car at the Indy 500 that year). He said to me, "You're going to be in the parade aren't you?" When I gained my composure I mumbled a "Yes Sir!" or some other inane response. He then said to me very sincerely, "You know, of all the cars I worked on, I liked these the best!" Reflecting on this later, I realized he may have just been being his salesman self, but it made me feel like a million bucks and I have taken some glee in rubbing that event in the nose of all Shelby Mustang owners who look at me cross-eyed. So, this story is not so much hilariously funny but more mildly amusing or ironic. Anyway, he gladly signed the trunk of my Tiger, a signature which I still proudly display 24 years later. 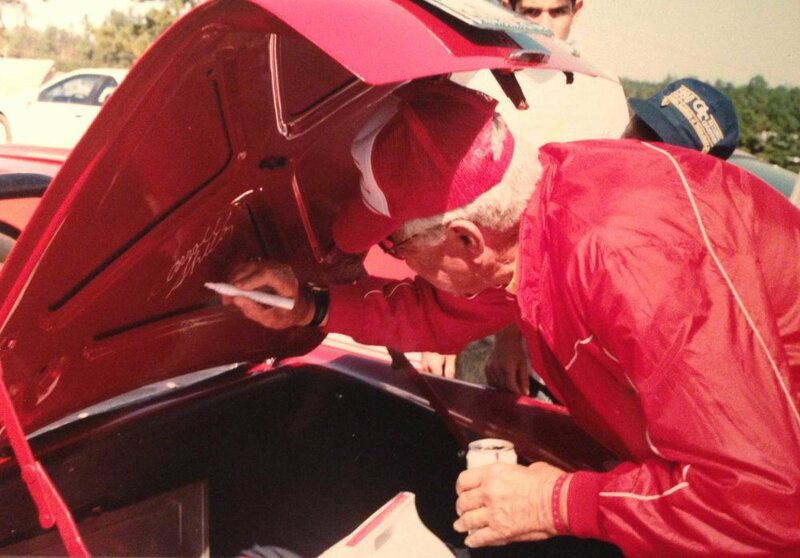 Attached are pictures of the Tiger (owned 42 years by me), my son with Mr. Shelby and him signing the car.